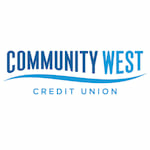 Community West Credit Union is the Michigan banking home of 25,000 members who use their five branches in Comstock Park, Grandville, Hudsonville, Kentwood, Middleville and Rockford. They offer a diverse selection of financial services, including high-return savings and checking accounts, low-interest loans and credit cards. Members have access to mortgages, car loans, credit cards and investment accounts.